Posted by admin in activity reports, eruptions, Indonesia, Karangetang, Merapi, Sinabung. The Volcanological Survey of Indonesia (VSI) has adjusted the alert levels of three Indonesian volcanoes over the past few days: the alert level for Sinabung has been lowered, while the alert levels for Merapi and Karangetang have been raised. Sinabung, which re-awoke dramatically at the end of August, has seen no further significant explosive activity during the last two weeks but is still producing plumes to altitudes of several kilometres and cyclically inflating and deflating. The government’s evacuation order for the surrounding area remains in force, although many local people have been returning to their homes. Yesterday the VSI reported that ‘the activity of Mount Sinabung showed a decrease according to observations of seismicity, deformation and SO2 concentration’, and accordingly lowered the alert level for Sinabung from the highest level of Red (level 4) to the second-highest level of Orange (level 3). A PDF of the announcement (in Indonesian) can be downloaded from this page on the VSI site. Merapi, a youthful and highly-active volcano with a deadly history, has been quiet since May 2008. 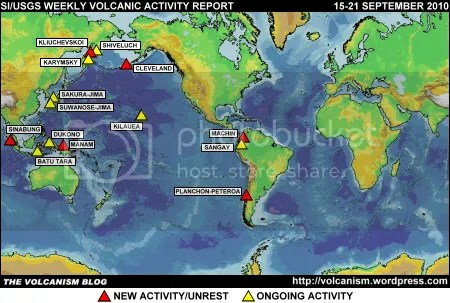 Early this month an increase in seismicity was detected which became more marked over the first two weeks of September. By 19 September the VSI was reporting high levels of seismicity and signs of inflation on the southern flank of the volcano (up to 11 mm per day), and increased gas emissions. After evaluating the observations and data from Merapi, the VSI raised the alert level for the volcano from normal (level 1) to Yellow (level 2) on 20 September 2010. Karangetang, also known as Api Siau, erupted on 6 August 2010, leaving four people missing and one confirmed dead according to news reports, as a lava dome collapse produced pyroclastic flows that descended the west flank and swept away a number of houses. An ash plume from the eruption rose to 9.1 km altitude. The alert level for Karangetang (contrary to some news reports) was not raised at the time of this eruption but remained at Yellow (level 2).During September Karangetang has continued to display high levels of seismic activity, with an episode of tremor beginning on the evening of 22 September prompting the VSI to increase the alert level from level 2 to Orange (level 3), the second-highest alert level, on 23 September 2010. News reports yesterday spoke of lava being erupted by Karangetang, and ‘thunderous explosions’ being heard by people in surounding communities. There have been no reports of further eruptive activity at Mount Sinabung in Sumatra following the eruptions of 29 and 30 August. Many of the 30,000 villagers evacuated from the environs of the volcano have been returning to their homes despite warnings from Indonesian volcanologists that it is too early to say that the situation is safe: ‘Our instruments have recorded continuous tremors in the volcano, which means that there is magma pushing upward’, says government volcanologist Agus Budianto, ‘We think there’s still a possibility that it will erupt again’. Ashfall from Sinabung has damaged crops, threatening the livelihoods of local farmers. Meanwhile there are warning from both the Indonesian Government and relief agencies that living conditions for the evacuated people who remain in the temporary shelters are very poor, with bedding and breathing masks in short supply and the danger of disease spreading in the overcrowded accommodation. The NASA Earth Observatory has a satellite view of Sinabung and surrounding area from 19 May 2003, which shows the intensive cultivation of the region around this volcano. Today, Monday 30 August 2010 at 06:30, Mount Sinabung re-erupted with a column of 2000 metres altitude above the summit. Please be warned of ashfall around Sinabung. Evacuations have been continuing, with around 16,000 to 20,000 people from villages around Sinabung now living in government shelters. Masks have been distributed by government emergency officials as respiratory problems caused by ashfall are a major hazard. 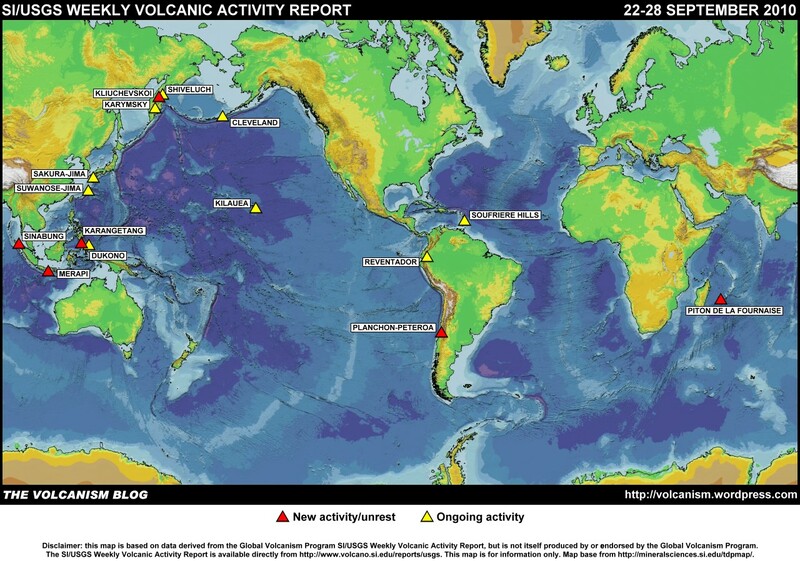 There is some confusion about the height reached by the emissions produced by this latest eruption. Darwin VAAC (archived advisories here) has issued several volcanic ash advisories (0022Z, 0038Z, 0130Z, 0620Z) warning of ash at FL200 (20,000 feet / 6000 metres) but reports that local weather conditions have prevented satellite confirmation of the ash cloud. Darwin gives ‘CVGHM’ – i.e. the Indonesian volcanological authorities – as the source for the FL200 report, but the VSI clearly states ‘2000 metres’, and head Indonesia volcanologist Surono is quoted in the media as saying that ‘volcanic materials were thrown about two kilometres into the sky’. The BBC News report hedges its bets with talk of the volcano ‘sending ash and smoke several kilometres into the atmosphere’ (journalists do love their volcanic ‘smoke’), and reports that domestic flights from Medan Airport have been suspended because of the eruption.